Financial issues are frequently one of the main contributing factors to divorce in America. Arguments and insults between spouses related to the stresses of debt, job loss, monthly bills, and constant expenses can sometimes take a toll on a marriage that cannot be overcome. For many couples the only reasonable solution to this problem is to start fresh; bad credit wiped clear through bankruptcy and a divorce. Often times, the two seem to go hand in hand. But, the order in which they occur could drastically affect the outcomes of each. So, if you and your spouse are pursing bankruptcy as a debt solution, and are considering getting divorced, the timing for these two separate legal actions could be very important to you and your spouse, both mutually and individually. When pursing both legal actions simultaneously, you probably will be informed that one filing will need to be completed before the other can begin. It may be wise to consider filing for Chapter 7 Bankruptcy first if you have a significant number of unsecured debts you obtained together. Because both actions involve a distribution of assets between parties, the courts will often require the bankruptcy to be completed first. If there are possessions that must be sold off or accounts that must be dispersed to pay debts, those things must be completed before you and your ex can decide who gets those remaining possessions you’ve acquired throughout your relationship. Filing for Chapter 7 Bankruptcy should take about three months ideally, allowing your division of assets at your divorce to hopefully be concluded more smoothly and quickly. Although you most likely will need to file for, and complete, your bankruptcy case, there may be a few reasons why you may benefit from doing the opposite. Financial Benefits: If you and your spouse have a combined income that disqualifies you for Chapter 7 Bankruptcy ¾ forcing you to commit to a debt repayment plan through Chapter 13 Bankruptcy¾ you might benefit from filing for divorce first. Separately, your individual incomes may allow you to each file Chapter 7 Bankruptcy. Depending on your unique financial situation, this could be extremely beneficial to you both in the long run. Protecting Your Property: In some cases, completing your divorce first may allow you both to keep certain crucial assets like a home or a car. Of course, it’s not wise to assume that you’ll get to keep these items automatically. Consult with an attorney who understands the complexities of both bankruptcy and divorce laws to learn how you might be able to save some property during a bankruptcy filing. 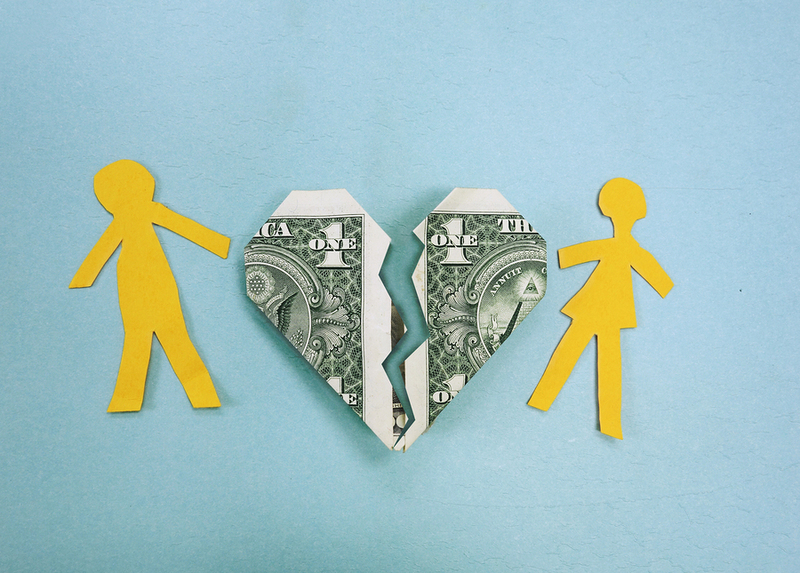 Child Support and Bankruptcy: If you and your spouse have any children together, it might be wise to consider completing your divorce before filing bankruptcy. Having child support responsibilities can be extremely taxing for anyone struggling to pay their other bills too. Having a set child support amount already in place prior to filing for bankruptcy individually will play an important role in your bankruptcy’s repayment plan decision. You don’t want to find yourself struggling to make any bankruptcy repayment plan amounts because the Bankruptcy Court didn’t take any hefty child support dollars into consideration. Of course, as with any legal matter, every case is unique and different. Before making any serious decisions about divorce or bankruptcy, it’s important to consult with an experienced attorney who understands the laws concerning both. Having to face just one of these cases alone is difficult enough at such a vulnerable time. Having to live through the complexities of both simultaneously can sometimes seem unbearable for many. An attorney can help you step by step through the process and hopefully minimize your added stress. Michael E. Bryant has been compassionately serving residents of Lucas County, advocating for them through difficult divorce and bankruptcy cases. If you have questions about either legal action and are looking for answers, contact Michael E. Bryant today. One simple call to 419-243-3922 can get you on your way to the fresh start you’re looking for.